Congenital infiltrating lipomatosis of the face (CILF) is a rare disorder in which overgrowth of fatty tissue with infiltration of underlying structures leads to craniofacial deformities and asymmetry. Imaging plays an important role in the diagnosis, surgical planning and evaluation of underlying structures. To our knowledge, our case is the first to describe CILF associated with isolated enlargement of a cerebellar hemisphere in the absence of an enlarged ipsilateral cerebral hemisphere (hemimegalencephaly). A male 1 year and 9 months old was referred for a magnetic resonance imaging (MRI) study of a left facial mass present since birth. The mother gave a history of two previous liposuctions performed at 3 months and 15 months of age. The mass recurred after each procedure. Previous ultrasound examination demonstrated a mass consisting of adipose tissue that was confirmed histologically. 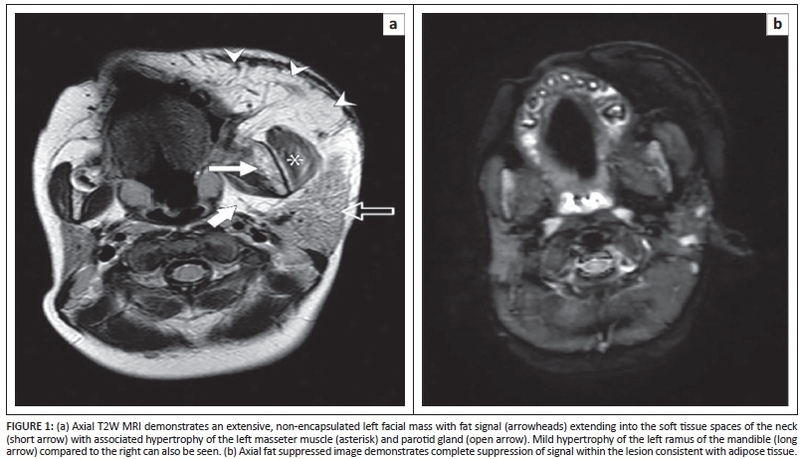 MRI demonstrated an extensive, non-encapsulated left facial mass with signal corresponding to that of adipose tissue. The lesion extended into the left masticator, submandibular, parotid and parapharyngeal spaces with associated hypertrophy of the masseter muscle and the parotid and submandibular glands. Mild hypertrophy of the left sphenoid and maxillary bones as well as the ramus of the mandible was noted (Figures 1a-1b). The left cerebellar hemisphere was enlarged with slight displacement of the midline to the right (Figure 2a). There was no evidence of hypoplasias, dysplasias, infarction or previous infections of the cerebellum. The remaining soft tissues, bony elements and intracranial structures were unremarkable (Figure 2b). A diagnosis of CILF was made based on imaging findings, histology and clinical presentation. congenital in origin with a tendency to recur after surgical excision. CILF may occur as an isolated condition; or associated with intracranial abnormalities and neurocutaneous syndromes; or as part of 'total unilateral hypertrophy'2. 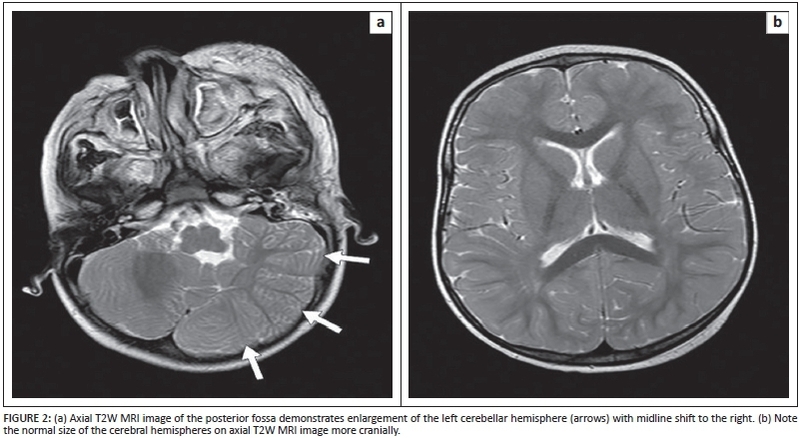 Intracranial abnormalities described include hemimegalencephaly, arachnoid cysts, mucosal neuromas and lipomas.1,3 To our knowledge, our case is the first in the literature to describe CILF associated with isolated enlargement of a cerebellar hemisphere in the absence of hemimegalencephaly (Figure 2a-2b). CILF is a rare congenital disorder characterised by overgrowth of fatty tissue of the face which leads to craniofacial deformity and asymmetry. Imaging plays an important role in the diagnosis and management. Our case is the first to describe CILF associated with isolated enlargement of a cerebellar hemisphere in the absence of hemimegalencephaly. E.G. (University of Pretoria) wrote the original manuscript and worked on the literature review. J.S. (University of Pretoria) worked up the patient, contributed to diagnosis and was involved in the final editing of the document. F.E.S. (University of Pretoria and Steve Biko Academic Hospital) edited the document and contributed to writing the legends and preparing images.